Yeast cells are able to tolerate and adapt to a variety of environmental stresses. 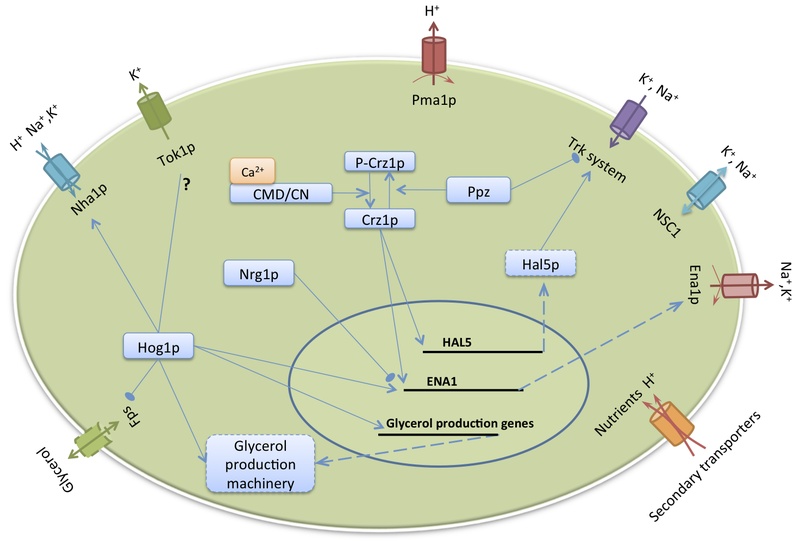 An essential aspect of stress adaptation is the regulation of monovalent ion concentrations, which determines many parameters that are fundamental to cellular physiology, such as cell volume, plasma membrane potential and intracellular pH. The regulation is achieved through the remarkably coordinated activities of ion transporters, regulatory molecules and signaling pathways. During my PhD at Imperial College London, (with Piers Ingram and Ken Haynes) I have constructed a mathematical model to characterize the impact of ionic, osmotic and alkaline pH stresses on cellular physiology and analyze the role that individual components play in the cellular adaptation processes. A schematic diagram showing the remarkably concerted activities of membrane transporters, the gene expressions of signaling enzymes and the interactions between them in yeast cells.